The seemingly never-ending conflict known, in some political circles, as the “War on Terror” is explored in microcosm by The Wall, a tense, minimalist thriller set around the structure of the title. The simplicity here is rather breathtaking: An American sniper, his spotter, and an Iraqi insurgent, himself skilled at sniping, are engaged in a battle of wit and patience. Eventually, the action moves to that wall, a crumbling structure that is (ironically, given its importance) only a small comfort for the desperate and wounded soldier who finds refuge behind it. Dwain Worrell’s screenplay is admirably succinct in how well-contained this story is. There is essentially no baggage here to trip up the narrative that Worrell has woven around this simple set-up. We gain little insight into the primary protagonist or, for that matter, the other two characters, at least until a melodramatic revelation to which Worrell calls back at exactly the right moment in the climax to give it staying power. Even then, it’s the most basic kernel of information possible to know about the character in question. It’s enough, though, and combined with the performance of the actor in question, it hits surprisingly hard. It’s that kind of succinct character development all the way through. It works, and that might be because of Worrell’s commitment to the idea. 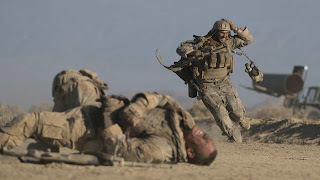 The premise finds Matthews (John Cena), the American sniper, and Isaac (Aaron Taylor-Johnson), his spotter, observing a grisly scene at the laying of a pipeline in the middle of nowhere: several dead oil workers and some brothers-in-arms laid to waste nearby. Isaac believes that each of the shots was to the head. Matthews is reluctant to trust this until he himself is hit as he scopes out the scene more closely. Isaac is forced by the crumbling wall while the Iraqi sniper (voiced by Laith Nakili) taunts him through his communications unit. Worrell and director Doug Liman gain a lot of mileage with their single-location gimmick (We shall call it what it is): The wall itself truly is crumbling and unstable, with Isaac easily creating a hole in which to place his scope (which is broken, a fact that, it turns out, is crucial). Isaac suffers a leg wound in the popliteal vein of his right knee. His canteen has a hole in it, depleting his water rapidly, and his radio’s antenna was damaged by the rifle fire. Matthews’s sniper rifle has landed next to his unmoving form, right in the crosshairs of the enemy. The enemy, by the way, is hunkered down in an unknown location. Through a mix of punchy editing (by Julia Bloch, who edits to the timing of the gunfire and the impact of the bullets) and stark cinematography (by Roman Vasyanov, whose job is more functional but who takes great care to capture the arid desert), this simple premise works. The performances, too, are solid. Taylor-Johnson must juggle a lot of psychological, physiological, and mental desperation, and he does so with intense fortitude. Cena has a moment of intense physical performance that is stunning to watch in its every, grueling moment. Nakili voices the enemy sniper with a lot of complex malice bubbling underneath the polite surface. The Wall doesn’t strain to be more than it is, and that less-is-more approach quite decidedly works in its favor.